Exit Position: Rear Exit Features and Benefits: Lifetime Warranty, Dyno Tested And Proven To Make Power, Performance Gains In Horsepower And Torque, Great Sound -Has A Smooth; Deep Tone, Easy To Install, Mandrel-Bent. All Welded. Built To Last. No one else gives you the bold clean styling of our Aftermarket Dress Ups, Suspension and Performance Parts for your American Muscle Car like UPR Products! 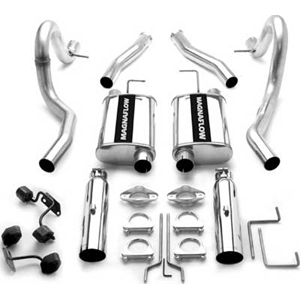 Click Here for Instructions Fits these Vehicles: 1994 1995 1996 1997 1998 GT V8 4.6L 5.0L Mustang Roush & Saleen Vehicles.